Could GE get booted from the Dow after 110 years? Could the Dow show GE the door? Shares of General Electric (GE) keep falling after the company reported lousy earnings last week. GE is down more than 30% this year, easily the worst performer of the 30 companies in the venerable stock average. It's already sold NBC and GE Capital, and has even put its light bulb business on the block. There's talk that new CEO John Flannery could unload even more assets. Now GE faces a question that would have been inconceivable not long ago -- whether it should lose its blue-chip status after 110 uninterrupted years as a Dow component. GE was one of the first components when the Dow debuted in 1897. Back then, the average included just a dozen companies. GE was removed and added back several times. It returned to the Dow in 1907 and has been there ever since. 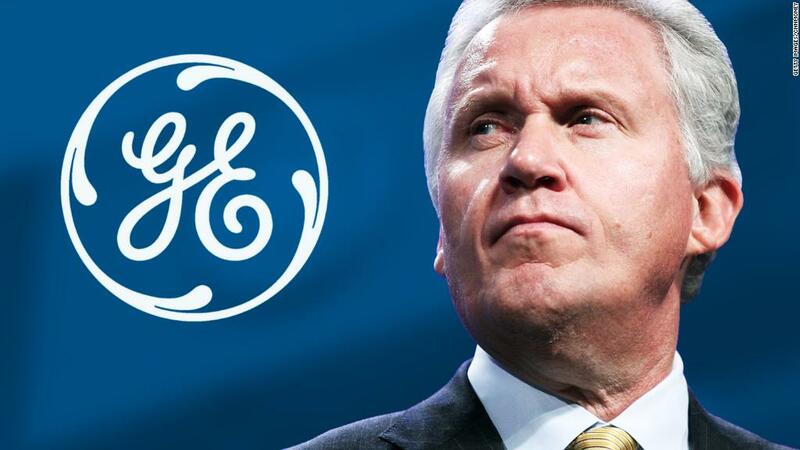 Here's why GE could be in real danger of getting booted again. Unlike the S&P 500 and most other major market barometers, the Dow is weighted by stock price, not market value. And even though GE isn't the smallest company in the average -- not even close -- it has the lowest stock price, about $21.40 a share. The folks running the Dow like to have no more than a 10-to-1 ratio between the stock with the highest price and the stock with the lowest. Boeing (BA) trades at about $258 a share -- nearly 12 times the price of GE. Goldman Sachs (GS) and 3M (MMM) also trade at more than 10 times higher. Still, the people who manage the Dow are reluctant to make big changes willy-nilly. Technically, a new company was added to the Dow just this summer. And it's even named Dow. DowDuPont (DWDP) joined after Dow Chemical merged with DuPont, an existing Dow component. The most recent change before that was in September 2013, when Alcoa (AA), Bank of America (BAC) and Hewlett-Packard (HPQ) were removed and replaced by Goldman Sachs, Nike (NKE) and Visa (V). By way of comparison, stocks are added to and dropped from the S&P 500 much more often -- usually because a company has been bought or has become too small. David Blitzer, managing director and chairman of the index committee for S&P Dow Jones Indices, had no comment about the speculation surrounding GE being removed from the Dow. GE was not immediately available for comment. But it's worth noting that while GE's ever-shrinking stock price may not be bringing good things to life for investors, GE is not the smallest company in the Dow by market value. GE has a market value of about $185 billion, higher than Merck (MRK), Disney (DIS), IBM (IBM), Nike and 10 other Dow components. The smallest Dow company -- insurance firm Travelers (TRV) -- is worth just $36 billion. But GE's problems may remind people of other erstwhile titans of American commerce who were once in the Dow -- companies like Sears (SHLD), Eastman Kodak (KODK), the defunct Bethlehem Steel and Woolworth, which now is known as Foot Locker (FL). So could GE really be kicked out of the Dow? It's possible. But don't bank on it just yet. It's true that the Dow is not meant to be a representation of just the largest companies. If that were the case, Amazon (AMZN), Facebook (FB) and Google owner Alphabet (GOOGL) would be in. And yes, GE is a shell of its former self. But what's left is a large industrial company with $125 billion in annual sales. So to paraphrase Mark Twain -- who was still alive when GE joined the Dow -- the rumors of its demise may be greatly exaggerated.